Saw Bloc Party last night at the Mayan in Downtown L.A. This video starts with a cute onstage marriage proposal. Yet another good video from the BriTANick guys. 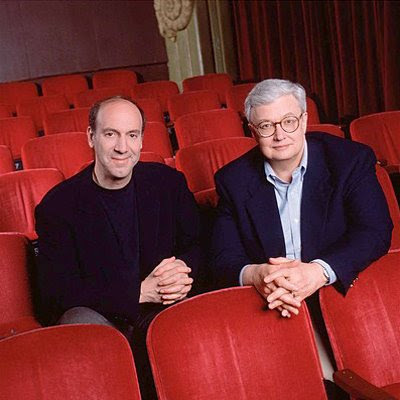 RIP "Siskel & Ebert" and "Ebert & Roeper"
One of the longest running shows in the history of television has come to an end, and as a huge fan of both the show and its three main critics, this news makes me truly sad. It feels as if the death of film criticism is just around the corner. Variety is reporting that "The Dark Knight" grossed $60 to $63 million its first day, including $18 million from midnight shows. Wow. It may have a shot at besting "Spider-Man 3" after all. 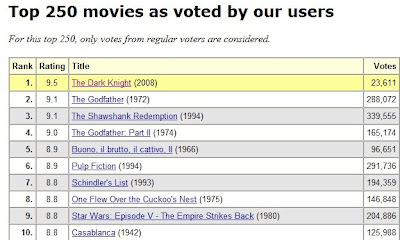 So, just how much will The Dark Knight make this weekend? I've been hearing estimates ranging from $100 million to $153 million. The largest weekend tally belongs to Spider-Man 3 (sigh), which grossed $151 million. Does The Dark Knight have the stuff to break the record? I think not. For one thing, the movie is 150 minutes long, which will limit the amount of screenings per day. Second, it's dark and brutal, unlike the Spider-Man films, and that will limit its appeal to women and parents with young children. But, if the amount of sold-out midnight screenings are any indication (or the massive line of people that gathered at Virgin Megastore to get the autographs of composers Hans Zimmer and James Newton Howard), this film is going to do very, very well. My guess: $125 million. What's yours? Christopher Nolan's "The Dark Knight" both soars and suffers due to its own ambition. Nolan is one of our great young filmmakers -- a storyteller who wants to make you think while you're being entertained. Both "Memento" and "The Prestige" rank among this decade's best works because they so delicately balance their desire to please and challenge the audience. Yet, when it comes to the "Batman" movies, Nolan errors on the side of sophistication. Perhaps because his protagonist is a man who dresses up in a suit with pointy ears, Nolan tries too hard to emphasize the symbolic importance of Batman. He works too hard to make this movie about more than its superhero. "The Dark Knight" ends up being about the morality of a vigilante, about the futile efforts of striving for control in a world of chaos, about how evil will always find a way to match good. It's about a lot of things, and yes, the issues are interesting and quite surprising for a comic-book movie. Yet, that's not what made my audience cheered. What delighted everyone the most was one three-second moment: Batman is on his Bat-Pod and needs to turn around. All he has to work with is a brick wall, and what he does is completely awesome. It's so brief, so inconsequential, and yet, it's the kind of thing that can lift your spirits and make a movie soar. And "The Dark Knight" needed more of those moments. Heath Ledger is the reason to see this movie. His Joker is a hoot. He's a man whose hobby is to set up horrific social experiments and watch how people react. He's a man whose very existence is the result of there actually being a Batman, thereby setting up the need for a hero-and-villain duet of sorts. "You complete me," the Joker says to our caped crusader, and the scary thing is, he's absolutely correct. Whenever Ledger is talking, we're captivated by what he's saying and how he's saying it. That can't really be said for anyone else. Everybody in the movie seems to have at least one monologue. The difference is that the Joker's monologues are about how he fits into Gotham City; his speeches seem personal, as if they were devised for his own purposes. All the other monologues feel aimed at the audience -- "okay, moviegoers, this is what you should get out of this." Again, the Nolans (brother Jonathan co-wrote the script) are trying too hard to make this superhero epic more than what it is. I'm not saying a superhero movie shouldn't be deep or provoking. It can and should be. But it must also be a form of pop entertainment, and finding that mixture of explosions and exposition can be tricky. The only director who has managed to pull it off recently is Brad Bird, whose "The Incredibles" had both psychological depth and show-stopping spectacles. I'd love to see what Bird would do with "Batman," but we're stuck with Christopher Nolan, who is, mind you, more talented than just about any other Hollywood director. Yet, it's frustrating when such an incredibly gifted filmmaker is linked to the wrong project. There was never any doubt that Nolan's "Batman" movies would be fascinating. They've just yet to floor me. They're incomplete, much like their hero. I'm off to the gym so that I can look more like Christian Bale, but here's my quick "Dark Knight" assessment: good, not great. Pretty much whatever you thought of "Batman Begins" is what you'll think of "The Dark Knight." Do see it in an IMAX theater though... it looks fantastic. More later, as well as some belated thoughts on "Wall-E."
You've probably seen this. You probably hate this. ... starring Sacha Baron Cohen as Detective Holmes and Will Ferrell as his partner, Watson. Brilliant! And I'm sure I'm not the only one who's excited by this news... Vinny? The little article I wrote on this movie is here.